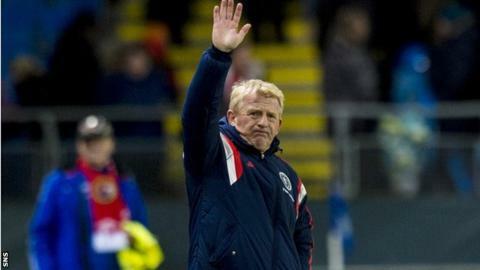 Gordon Strachan offered a typically pithy response on Tuesday night when I asked him to assess his time in charge of Scotland so far, with the international football year now at an end. "I'm still in a job," he grinned. Perhaps the immediate aftermath of a game on a freezing November night in Norway was not the ideal circumstance in which to examine the issue in depth. It would be interesting, though, to hear the manager properly analyse the events of the past nine months. Certainly his assessment of the match in Molde was a frank one. He knew his team were hugely fortunate to win and also that the performance had not been anywhere near as impressive as those that brought victories over Croatia (twice) and Macedonia. In fact, performance-wise, this friendly double-header against the USA and Norway has been disappointing, although in terms of results it has been pretty satisfying; a 0-0 draw and a 1-0 win. Strachan has emphasised recently that it's always about results, but he conceded post-match in Norway that he'd have liked to have seen a better display from his team. Clearly these matches represented opportunities to have a look at players who haven't been regular starters since the manager took over in February. Though that didn't mean wholesale changes, there was a disruption to the cohesion that had developed in the latter qualifiers. Of the players given the chance to impress, David Marshall was probably the stand-out, despite not having to make world-class saves, he looked assured in both games. Given the paucity of centre-back options, Gordon Greer did his chances of adding to these two caps no harm with a couple of good showings. On the flip side, Craig Conway, Charlie Adam and Craig Bryson may feel they could have done more to try to play their way into contention for a regular starting place. And one has to feel for Gary Mackay-Steven and Lee Wallace, who would have been desperate for a more significant role over the two games to show they can perform at this level. No doubt their time will come, but to return to the original theme of an overview of Gordon Strachan's tenure, the manager's own response rather underplays the reality of the situation. Davie Provan, an astute and to-the-point observer of the game, remarked after Friday's drab draw with the USA that a similar performance under Craig Levein would have been severely criticised - and he's right. So would Tuesday's outing against Norway, but the harsh reality is that while Scotland played as badly in those games as they often did under Levein, not once against comparable opposition did they churn out the kind of victory they did in Molde. And nor could the previous manager point to many genuinely impressive showings to counter-balance such criticism. That is where Strachan has earned the slack that he will be cut, because the signs of progress have been evident. So when Scotland return to friendly action in March 2014, the manager will continue to fine tune things, with the aim of starting the Euro 2016 qualification campaign in a positive manner. But he will be acutely aware that that is when he will be truly judged and if he can still say he's in a job at the end of that campaign, the chances are Scotland will be heading to France. Plenty of hard work lies ahead, but Scotland remain on the road to recovery.